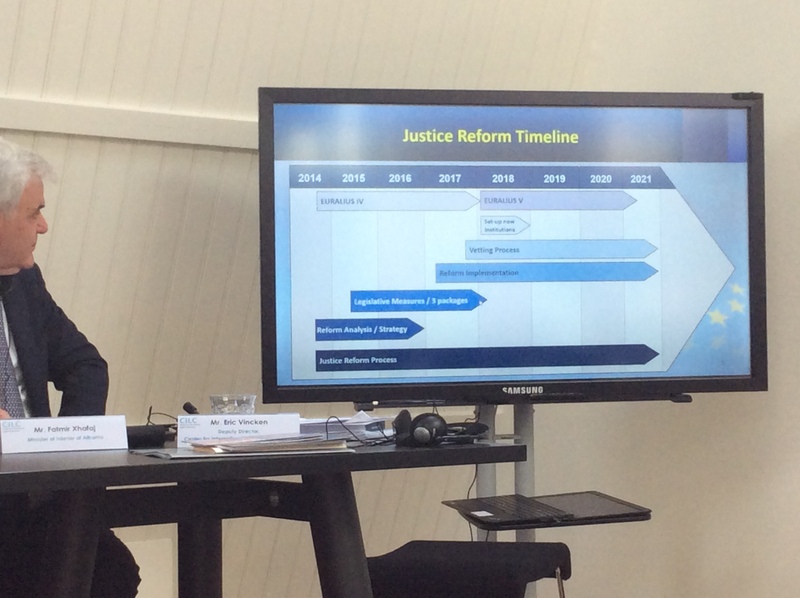 For the first time since the beginning of the vetting, EU-funded justice assistance mission EURALIUS has given a timeframe for the completion of the justice reform and the vetting. In a presentation yesterday during a debate organized at the The Hague office of CILC, one of the partners in the EURALIUS mission, EURALIUS Team Leader Agnes Bernhard suggested that the vetting will supposedly end in three years, in 2021, just in time for the next parliamentary elections. The same timeline seems to indicate that it will take until the end of 2018 to set up the new judiciary institutions, including the High Prosecutorial Council (KLP), High Judicial Council (KLGj), and Justice Nominations Council (KED). As long as these councils are not installed, the current paralysis of the Constitutional Court and the lawless situation at the Prosecution Office are expected to continue. During the debate CILC Deputy Director Eric Vincken voiced his hesitant concerns regarding the slow progress of the vetting and spoke of his fear for “losing the momentum” and a scenario in which the judges and prosecutors remaining after the vetting will not have the means to rebuild a new justice system. The slow progress of the vetting, with only one hearing per week so far and no new hearings planned for the coming weeks, is partially the result of the decision of the Rama government to slash 40% of the vetting institution employees. Even though the vetting procedure is expected to run along 4 parallel tracks, the KPK is currently running at 25% of its planned capacity. Minister of Interior Fatmir Xhafaj responded that he expects the KLP, KLGj, and KED to be installed before the summer – a claim also made by US Ambassador Donald Lu, which we debunked last month. Minister Xhafaj further claimed that the current inflow from students of the School of the Magistrature, and “several hundred” students that will start their education in the coming years, will fill up the personnel gap in the judiciary branch. As Exit reported before, the School of the Magistrature cannot accept new students as long as the KLP and KLGj have not been installed. Finally, Minister Xhafaj claimed that the Justice Reform will also allow gaps in the Constitutional Court to be filled up legal councillors without any previous experience as judge. Currently the Independent Qualification Commission (KPK) is vetting three (former) councillors to the Constitutional Court as potential Constitutional judges: Valbona Bala (Pajo), Arta Vorpsi, and Elsa Toska. The three “streams” of new judges and prosecutors mentioned by Minister Xhafaj: recent graduates, future graduates, and promoted legal councillors do not seem to cover the massive personnel loss that is to be expected as a result of the vetting. Of the 22 judges and prosecutors that have received a final verdict from the KPK, only 14% have been so far confirmed. Even if this number were (unrealistically) bumped up to 50%, this means a personnel loss of 400 judges and prosecutors by 2021. The output of the School of the Magistrature for 2018 was 16. The only solution to these problems will be found in an ongoing stream of “ad-hoc” legislation, approved unilaterally by the Socialist majority, thus further politicizing a reform that – in some type of utopian scenario – was actually supposed to depoliticize the judiciary branch.